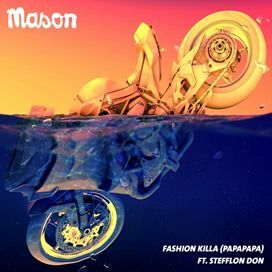 ‘Fashion Killa (Papapapa)’ is the highly infectious, new dance track from Dutch production ace, Mason, on Island Records. Now available to download, ‘Fashion Killa’ features the UK’s hottest new rap star, Stefflon Don on vocals and is already shaping up to be this summer’s crossover smash with heavy support from Lauren Laverne, Annie Mac, Andi Durrant, Capital Xtra’s Clubbers Guide and more. Turn on your TV this summer and your feet will soon be itching to dance. The ‘Papapapa’ instrumental version provides the jumping soundtrack for the new Deezer TV ad, while the vocal version immediately grabs you, as the soundtrack to the massive BooHoo summer TV ad campaign. The newly launched video shows a tongue-in-cheek scene from a hair salon where fashion statements are taken to the extreme! ‘Fashion Killa’ looks set to dominate the airwaves and tear up the dancefloors across all your favourite holiday destinations. Mason first crashed into the mainstream consciousness with his international crossover hit 'Exceeder' in 2006 and hasn’t rested since. His productions have appeared on some of the coolest imprints out there, including Fool’s Gold, Great Stuff, Cheap Thrills and Boys Noize, as well as on his own widely respected label, Animal Language. ‘Fashion Killa’ is typical Mason; a genre-blurring, addictive groove with plenty of funked up happiness. Starting life as an instrumental with the insanely catchy, looping ‘papapapa’ vocal delivering shades of a young Michael Jackson, the track was soon crying out for a quality full vocal. Step up to the mic, Stefflon Don. Hotly tipped as the UK’s answer to Nicki Minaj, Stefflon Don has risen rapidly through the ranks of the UK grime and hip hop scene. With a series of big tracks on the underground, including guest vocals on K Koke’s single ‘I’m Back Again’ and consistent support from the likes of SBTV and GRMDaily, Stefflon Don has a very bright future ahead. On ‘Fashion Killa’ she delivers a sure fire killer vocal, full of sass and attitude, bouncing off the music to take the whole track to another level. The massive remixes come from the hip-house collective Bon Voyage (led by NYC frontman Shamon Cassette with Dublin producers The Supreme and Fono), UK house hero Vanilla Ace, and hot London producer Endor, who’s just released his One More Tune / Warner Bros label debut, ‘Fever’. ‘Fashion Killa’ is the big summer tune sure to be stuck on repeat, in your head, and on the dancefloor, over the coming months.